Fishery manager Osgur Grieve reports that the last week of the season has been fairly quiet on the angling front, with the water dropping and the sunshine making an appearence. 3 grilse were caught for the week. Luc Montaudon (France) caught a 3.5lbs grilse on the 25th using a Cascade, and Johnny Betts (NI) caught a 3lbs grilse also on the 25th, which he returned. Paul Owens (UK) caught an escapee farmed salmon of 2.4lbs on a Stoat's Tail which he kept. A fresh fish of around 4lbs was lost on the morning of the 29th from the Bridge Pool, it's good to see the odd fresh fish still coming in to the system. After having perfect water conditions all summer for fishing a spate river now it's time to enjoy a little bit of Autumn sunshine. Thank you to all our customers this year and we look forward to seeing you all next year. Declan Gibbons reports the last week of the season has been one of mixed fortunes for anglers on Lough Corrib with some having great sport and success. One of the those successful anglers was Cian Murtagh of Cavan, who enjoyed two days fishing and had great sport on wet flies catching 5 trout out of Lydons Lodge B&B, Cong (094-954603). In the Oughterard area Kevin Molloy of Baurisheen Bay Boat Hire (087-9604170) reports Frank Doyle (Cork) boating 4 trout on wet flies on Saturday, and also on Saturday James and Aidan Kelly landing 4 trout on wets. Staying in the Oughterard area Basil Shields of Ardnasillagh Lodge (091-552550) was in touch to report on client Peter Boyle catching 6 fish on dry sedges on Saturday. On Sunday last Ennis & District Anglers held their end of season competition out of Greenfields with 12 rods taking part in it for 3 fish. First place went to Paul Dignam with 1 fish for 1.6lbs; in second place was Sean Dixon with 1 fish for 1.5lbs and third place went to Basil Shields with 1 fish of 1.4lbs. Staying in the Grenfields area Larry McCarthy of Corrib View Lodge Glencorrib (087-9135222) says Lough Corrib was extremely kind to his guests over the last few days of the season. All anglers staying at the lodge reported good fishing to wet flies especially in the Oughterard area and excellent dry olive fishing in the Ballynalty area. Tim Rowley from Cumbria and Peter De Pree from Edinburgh had amazing fun fishing with Larry over 5 days catching 14 trout, all fish were caught on dry olives and wet fly patterns with an average weight of 2.5lbs, 5 of them weighing over 3lbs and all sportingly released. 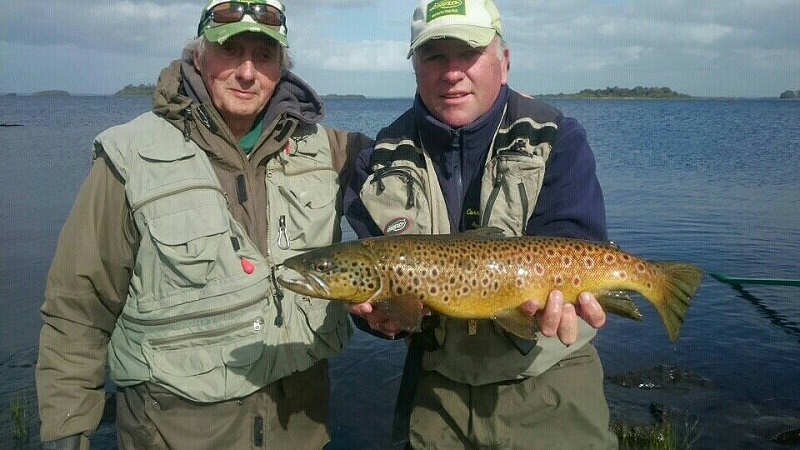 Tim Rowley (on left) with guide Larry McCarthy of Corrib View Lodge, holding a fine 3lbs+ trout landed by Tim on L. Corrib. The fish was sportingly released after the photo. On Friday last Ballinrobe angler Kevin Egan enjoyed a day on Lough Corrib which saw him land 2 nice trout on dry sedges, both of which he sportingly released. 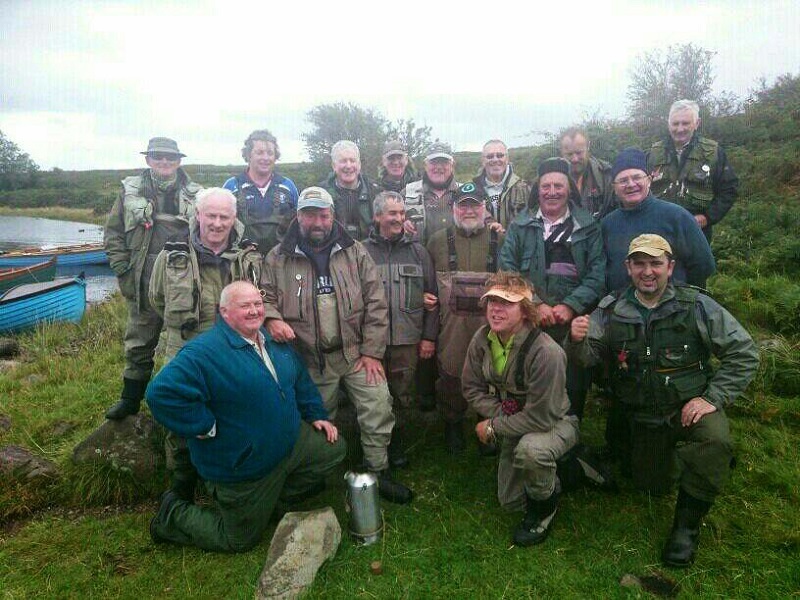 Eamon Gavin reports on Wednesday last Cornamona Anglers hosted anglers from Killarney and Macroom who are regular visitors to the area for an end of season day out in which 17 anglers caught 11 trout. A good day was had by all and the group were treated to an island cook up with locally produced Connemara Hill Lamb on the menu! Some of the Cornamona Anglers, joined by friends from Killarney and Macroom, enjoying a day out including a fine cooked island lunch, to mark the end of the season on Corrib.